We have tried few 16 inch wheel trims on Mercedes Sprinter 2007. For some trims we had to remove the plastic centre cap from the wheel. We have found that this set fitted perfectly (as shown). We believe this set will fit most van wheels as long as the wheel centre is in line with outer wheel rim edge and is not sticking out. If the wheel centre is raised too much then these might not fit. 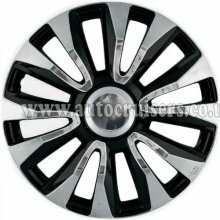 For guidance and illustration of wheel shape we have added the image of van wheel.